So we moved into our house on Thursday. I drove the very short distance to the center to pick up our kids while Andrew stayed at the house with Levi and Ivey who built a special 'welcome to our new house' track for the train. 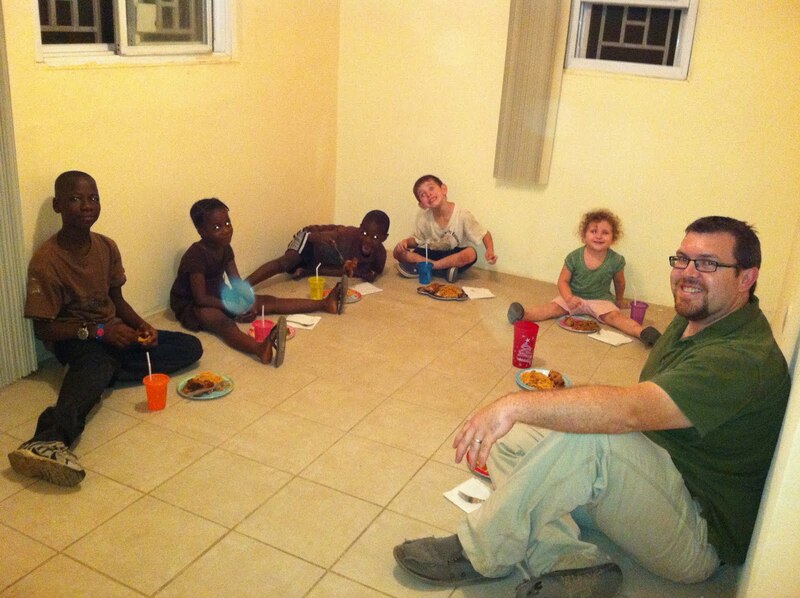 When I got to the center they were just sitting down to dinner so all the kids were in one room and Uncle Daniel announced that the Sisco family should go and collect their things. The room erupted in OOOOOOOOOOHHHHHHHHH (if you've been here you know the 'oh' I am talking about), and cheers. Albert cried and John grinned from ear to ear. I couldn't locate Isatu quickly enough to know her reaction. The kids sang 'It's so hard to loose someone like you' (again if you have been here you know the song I am talking about). It was very touching. They packed their backpacks and hugged their aunties and uncles goodbye. We drove down to the house and when we got there Levi showed them the train, we showed them their new mattresses(I can't say bed because those haven't been built yet) and rooms. And then we ate dinner together on the floor. We do a lot of sitting on the floor right now because it takes a while to get things built. We have bought 5 kid size stools and that is it. We have a work table and shelves ordered for the kitchen and we hopefully will be able to get to town soon to order our couch. I have been amazed at how well everyone has done so far adjusting. Levi andIvey seem ok with all of the changes of moving cultures and are already speaking some Krio. Levi is calling seashells cockles Ivey is saying she has to go wet when she needs to go to the bathroom. Albert, John and Isatu seem to be dealing well with all the changes of living in a new home with very strange new people. 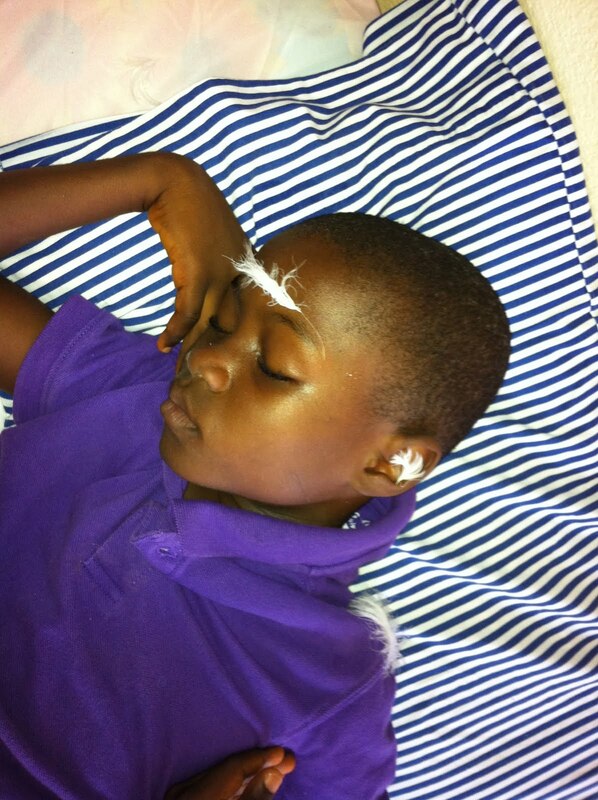 The other day when they were supposed to be resting Levi pulled feathers out of his pillow, tiptoed across the room and put them all over John. And so it begins. don't have furniture yet) laughing. Albert is mostly quiet but he does laugh and joke a lot. And Isatu is my shadow. Where ever I go she is right behind. We have tried to have moments alone with all the kids and after dinner we give each one a chore to do. Last night Levi and Ivey cleared the stools while John swept and Albert mopped(both very necessary) and Isatu was supposed to help dry the dishes that I washed. I ended up getting distracted several times though and everyone ended up showered and in bed before I could get to it. They all really like to do the chores and she was a little upset that she didn't get to do hers so we let her stay up to do it. I cleared her a spot on the counter by the sink and gave her a towel. We talked about her favorite food, color, aunties, friends, etc. until all seven plates, seven cups, seven forks, and a hundred misc. items were dried and stacked on the counter beside her. I look forward to that being a time that we enjoy with each of our kids. We have tried to be somewhat organized and so we have different colored plastic cups with lids and straws. Each child has been allotted a color to remember so that we don't go through more than one cup a day. Albert is orange, John is yellow, Isatu is pink, Levi is blue, and Ivey is purple. While doing dishes last night Andrew was remembering that hetoo had color coded cups growing up. He was yellow, Katie was green, and Rachel was red. I am sure that I will come up with more solutions to simplify life but if anyone has any time savors like that please share. Speaking of the dishes, I know that no matter where we live we will have some things to deal with that are difficult or frustrating. The dishes are one of them. Because we have a gas stove (I guess) black soot gets all over the bottom of the pots when we are cooking and then when you move it anywhere it gets all over whatever you sit it on. Then it is hard to get off the scrubber or your hands. It makes such a mess! I had to wash my hands three times to get it off. And, the soap doesn't really get sudsy so the soot just smears around. I am foreseeing that it could be the cause of a serious meltdown for me. Dirty floors and feet are also one of them. I have probably washed my feet 3times a day ever since we have been here. And, I have swept every day and mopped at least every other day and at the end of each day it is amazing how dirty it is. I have such a hard time feeling like things are clean even though I am spending a lot of time cleaning. Everything is more difficult. Our laundry area required a certain pipe to be put in so that meant it had to go in the garage. The garage floor is uneven so the spin cycle is pretty interesting. I literally lay across the top and hold the water discharge tube down in a bucket because it isn't connected to anything yet. We can't find the right size bucket for it. I shook so hard one time that the little legs that you screw up and down to make it even came off. And the hose went flying all around and soaked the whole place. I am happy to have it though and once we have a bucket and a platform for it we should be free of the shakes, spills, and brain injuries. I wish you could see the faces of the locals watching this fiasco. I am sure they wonder how wrestling machines could possibly be easier than handwashing. I had to read the manual which I have never done for any washer or dryer before but it has strange symbols so I didn't know how to work it. The kids are cracking me up because they would really like to start school so they keep praying at night that we would be able to start school the next day. Right now we don't have a table for them to sit at, a desk for me to put the stuff I need, or white board or anything yet. I sat them down to explain the situation today but I have a feeling that we will be having a repeat prayer tonight. We have a list of things to getbuilt but we have had a hard time getting it done quickly. We currently have two projects going at the same time from two different carpenters and both have told us wewouldget our items on Saturday. If we can find a third carpenter we will start another project. And then of course we will start new projects with each carpenter as they finish the first. I know that sounds like a lot of complaining but through all of that we really do like this house. It is easy to locate everyone fairly quickly, there are no stairs or balconies, all the tile is neutral, it is flat and there are lots of trees. As a matter of fact the kids really like climbing one of them. When we toured the house I did not notice one of the trees but on one of the first few days living in the house Andrew was noting the fruit trees and commented that God had tripled the size of my lime tree. In the U.S. I had a lime tree that andrew gave me for valentines day a few years ago that I really loved and hated to give up when we left. But you can't pack a four foot lime tree so it now has a home at a neighbors house. This is the lime tree in our new yard. We also have a lot of mango trees around our compound and the bats get in them and make loud chirping noises at night. Then in the morning you can see where they have been eating the mangos. Then there are the roosters. Isatu says they say 'Coco Loco'. Ha. I always thought they crowed once magically at sunrise and then went back to strutting around pecking things but no. They say coco loco a lot. However, neither of these noises come close to competing with the noise that the dogs make. It sounds like 100 dogs are being beaten or something. It goes on forever and is really loud. AND it only happens at 10:00pm or later. We walked around the neighborhood yesterday and walked down to the beach. The fishermen were there pulling in their nets. Andrew and Albert walked over to watch and when I looked back to see where they had gone they were helping pull the nets in which was pretty funny to some women on the beach. 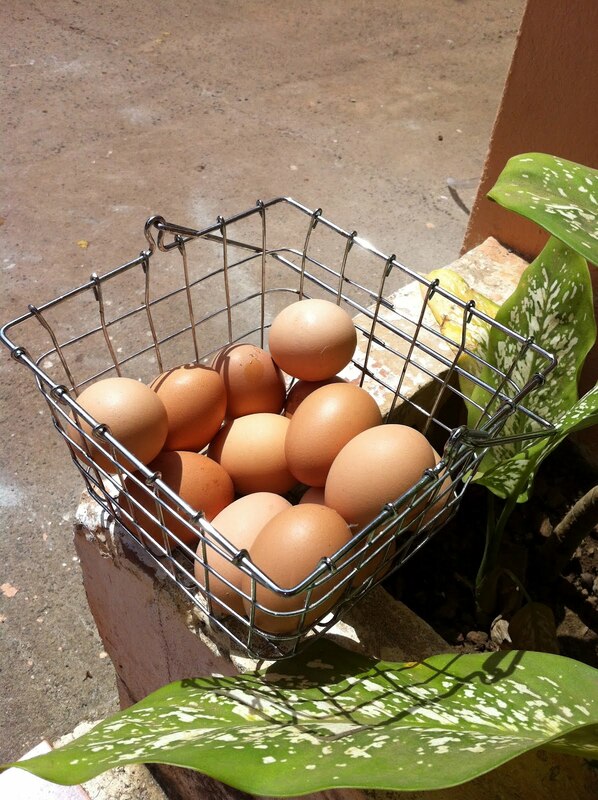 I can't explain myself but I really love that all 24 of my brown eggs are all stacked up in a little wire basket bought across the street by Samuel our security guard. 1. Mattress sizes are apparently not the same country to country. Andrew went to the factory and they sold him a 'queen' size and 2 'twin' size mattress that are the size of the full and king size in the U.S. So all the sheets that I spent months finding the best deals on are now unusable. 2. Butter is not rectangular like in the U.S. It comes packaged the size of two sticks of butter side by side so even the butter dish that came with our refrigerator is almost a square instead of a rectangle. 3. Saturday Andrew showed John(8) how to use a seatbelt. 4. Yesterday a lady came to the door with a muskat wondering if we would like to buy itfor security. The kids all held it and the plumber warned me that they bite so we gave it back to the lady and told her no thank you. 5. We go to the center for churchand after the service was over right as we were walking out of the gate John and Isatu's mother came to visit. We've never met her before and she stayed for an hour or so and then wewent home. So we have now met 3 of the 4 parents. 6. We had a situation yesterday that we've never experienced before. The power is out right now and so we have had to use the generator for the fans and lights. We try to make it as long as possible without it because it cost approximately $15 per day to run. That can get expensive if it goes on for days. Also of importance to know is that Abdul is sick so Andrew cooked dinner the last two nights. So, for the last two nights we turned the generator on when it got dark so that he could see in the kitchen and we left it on for part of the night until it cooled off. Now, before you feel sorry for us, here is the situation. Yesterday a lady came to our gate door and told our night guard that she lives in the house (which is probably not much bigger than our generator room) that backs up to our generator room. She asked if we would consider not using it because it is making her house extremely hot. The noise doesn't bother her but the heat is unbearable. I bet it is! It is hard to walk in that room because of the heat and I think it is loud so I am sure it is when lying next to it. Plus the smell is strong. So I feel terrible for that lady. But on the other hand I have to say I also feel bad for us. We just spent A LOT of money buying the generator, gas for it, and men to install the grate we needed to keep it secure, and an electrician to install it. We bought it because it is hard for an American who is used to air-conditioning to come to this climate without even a fan. There is no where else to put the generator so we don'tknow what to do. It is the quandary of the day. I know this blog update has been sporadic but it is all the information that I have accumulated since the last one that I have time to share. We hope everyone is well. We miss and love you all. 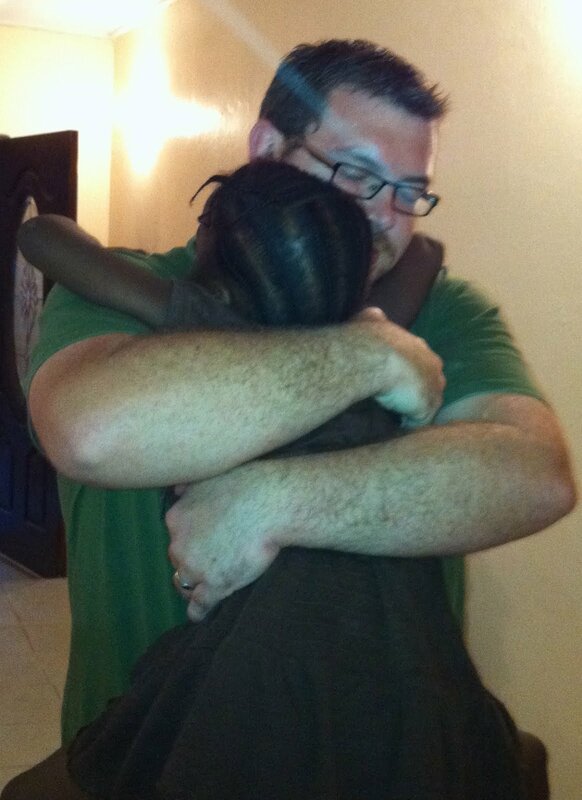 Love your new house and how excited everyone at the Center was when Albert, John, and Isatu got to leave with you. What a special poignant memory. The color coding it a great idea! I do that with my kids and it is a time saver. Enjoying these updates!! Great update. God is Good! That is SO exciting that you guys are all 7 under one roof now, and what a special "going away" routine at the Center. :) Everyone looks so happy. And will you PUHHH-LEEEEEZE try to get a video or at least some pictures of you doing laundry and being tossed around by the washing machine??? hahahaha. Cracked me up. I'm enjoying visualizing it, anyway!! Love you!